Shirts With Random Triangles: Baylor adds 11th recruiting class of 2015 member with Texas high school outside linebacker Clay Johnston. 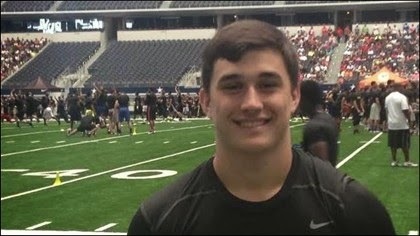 Baylor adds 11th recruiting class of 2015 member with Texas high school outside linebacker Clay Johnston. Clay Johnston. Photo via Texas Prep Report. Baylor has added a new member to its 2015 recruiting class. Abilene, Tx. high school rising senior outside linebacker Clay Johnston committed to the Bears on Tuesday. As is the norm these days Johnson made his announcement on Twitter. Baylor head coach Art Briles responded to the commitment of Johnson with one of those carefully coded "don't tell the NCAA I'm tweeting about a recruit" tweets coaches are so keen on tweeting out. Johnston attends Abilene Wylie High School in Abilene, Tx. (There are two Wylie Highs in Texas, so the Abilene one commonly gets the city's name attached to it.) He is graded as a three-star outside linebacker by Rivals.com. He stands 6'2", and weighs 200 pounds. Johnson is the 11th high school player to commit to Baylor's 2015 recruiting class.